← 12 Days of Gluten-Free Christmas Cookies! Are you tired of all the fall dishes yet – pumpkin and apples and squash? After a while all those orange foods make me feel blue. But, I still crave warming, comforting food. So, what’s a girl to do? Get spicy! So, here’s a quick and simple vegan chili verde recipe that I promise will make you forget all about your Thanksgiving leftovers and your yet-to-be baked Christmas cookies. It will soothe your over-shopped nerves, spice up your nights, and send those cold germs a’running. Heck, it might even cure world hunger. Nah, that’s going too far. Place a 2 quart sauce pan over moderate heat. Add the oil. When warm, add the onions and cumin and sauté until soft (about 5 minutes). Add the garlic, chiles, tomatillos, and broth. Simmer for the tomatillos are falling apart. Using a stick blender or food processor, blend the chili until thick and chunky. Add the beans and heat gently. Add the cilantro. Serve with a dollop of coconut cream and a squeeze of lime. Note: I used a vegetable broth that contained salt. If yours does not, you may need to add salt to taste. Also, I used mild chiles for my kiddo. If you like heat, go for the hot variety! For more tasty and healthy recipes, check out Slightly Indulgent Tuesday and The Hearth and Soul Blog Hop, and Gluten-Free Wednesdays. This entry was posted in beans, main dish, Mexican, soup, tomatillos. Bookmark the permalink. Thanks Miriam. I’ll go check out your blog, too! What a great winter meal! I looove anything with green chiles and will go for the hot variety myself. Thanks for sharing with the Hearth and Soul hop. YES, I am tired of seeing pumpkin everywhere! This chili looks like a breath of fresh (green) air. I love the inclusions of white beans and coco cream. Would you believe me if I said I am so sick of cooking and food after Thanksgiving and wasn’t even going to cook tonight–let the family fend for themselves with leftovers–then I saw this recipe. 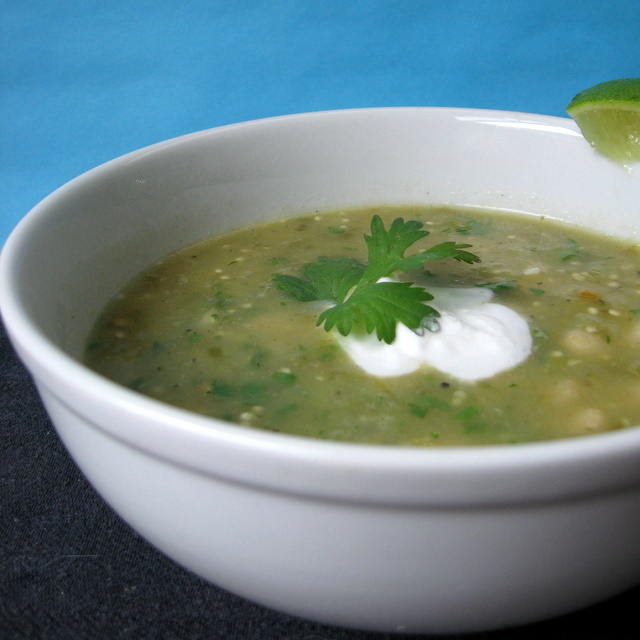 I have frozen tomatillo puree from a bumper crop this summer and this is making me hungry. I made this tonight! Soooo good! I 5x’d it for a family of seven (well, eight, but the baby didn’t eat it 🙂 , and we’ll end up with some (though not a lot) leftover. I substituted two large jalapenos, seeds and all. It was quite zippy! The kids gobbled it all up though, cooling it down just a bit with sour cream. YUM! I’m so glad you tried it and liked it! I’m typically just cooking for me and a kiddo these days, so my proportions are getting smaller, for sure. Said kiddo would like to point out that it’s very good with tortilla chips crunched up in it, too. I’m not sick of the fall foods yet, but this looks like a nice change anyway. Great recipe; this is perfect for a December night…love the beautiful green colors in winter soups, and you paired this perfectly with white beans and a cream topping. Love it! Thank you! Let me know if you do end up making it. I love that it’s a green thing that kids like anyway. It’s always so challenging to get kids to eat green stuff. You are so right about green – wonder why that is? Most of my kids are pretty adventurous – particular but willing to taste. Love that about them. was trying to find something to do with all my tomatillos from late fall and came across this recipe. i was missing a couple of ingredients and spent quite a bit of time getting all the ingredients all together. totally worth it! holy cow, this was so good, but i only got like two bowls out of it. making it again tonight (a bit off recipe) as the biggest batch in history with ALL THE TOMATILLOS. trust me, it’s in like a canning pot and currently simmering away. thanks for the awesome recipe! making this again today with fresh picked tomatillos and fresh picked onions. this is gonna be awesome! Try pozole (hominy) rather than the beans! Just an FYI… it’s typically “chile verde” (with an e) as opposed to “chili verde” with an “i”. Chile Verde means green chile. The traditional dish is VERY different that “chili”. I lived in New Mexico for several years. It’s a big chile state! Texas doesn’t seem to make a distinction (tex-mex I guess). Yep, I’m aware. But, up from “up north, there, eh” and we don’t make that distinction. Chili is the dish that has chilies in it, whether it has meat or beans or *gasp* spaghetti, in it. We’re weird up north.